If you're looking for a super talented, down to earth, and creative photographer I HIGHLY recommend Hazel Lining Photography! Choosing Steph as my Photographer was hands down the best decision I made throughout my entire wedding planning process. She was the perfect mix of joyful, humorous, and professional. As a type A bride, I thrive off of organization and again, Steph was there to deliver. Her organization made the entire process from start to finish very easy and stress free. It rained on our wedding day, but that didn't stop Steph from letting her natural creativeness shine through. Hazel Lining's pricing is more than fair for the great talent she possesses. The turn around time of our wedding photos was very quick which was an added bonus! I truly appreciate how thoughtful and empathetic Steph was while photographing our "must have" meaningful photos. Both my Husband and I are still blown away with Steph's amazing ability to capture the raw beauty of emotions on our special day. Again, if you're looking for a phenomenal photographer for any life event - Steph's your girl! We absolutely adored working with Steph. She was fantastic at bringing what we wanted to life, and was a dream to work with. Her creative direction was excellent, and she had us completely at ease while she captured the most perfect photos of our big day. The candids and the portraits are phenomenal, and are a great collection of the energy and the atmosphere and the love! We cannot recommend her enough and will be spreading the word to all our friends and family who are looking for a talented and friendly photographer. We got our photos back soooo quickly too, which was very much appreciated with the holiday season upon us! Thank you so much Steph!! As soon as we met Steph, we felt comfortable to be ourselves around her; there was no acting, no awkward poses, she's even tempered and excited to be doing what she loves best- shooting wonderful scenes. Prior to the wedding we discussed our "must haves" that were really important to us- Greg needed great music, and I needed a great photographer to capture memories that will last a lifetime, however Steph did more than that. Somehow she managed to capture all the feelings from that day as well, from the first look, to boogieing on the dance floor- she is phenomenal at what she does. Steph from Hazel Lining Photography captured our day perfectly! Her pictures were classy and creative and came out beautiful! We got all of our pictures back in less than 3 weeks. She was great working with both children and adults of all ages. Both Steph and her assistant were extremely easy to work with. Photography is a hobby of mine and something that I've done since I was young so needless to say we were very picky when it came to choosing a photographer. Steph not only met, but far exceeded our expectations. We would not hesitate to recommend Hazel Lining Photography to anyone looking for an amazing professional photographer to capture their special day! Steph is simply AMAZING to work with. Not only did she capture amazing moments for us (even in what felt like 100 degree heat!) - she and her assistant made our entire day go so smooth. She helped me plan and execute our timeline, she was always super responsive, and she turned around our entire gallery of pictures in less than 2 weeks - all while she was planning her own wedding! She talked to us and took the time to really understand what types of pictures we were looking for and made sure she got all of them done. Most of all - she was just a blast to work with and made us feel so comfortable! I couldn't recommend Hazel-Lining Photography more for couples who are looking for an amazing person and photographer for their special day. Hazel lining...WOW!! Not only are Steph and her team just insanely talented at what they do, but there's no matching their love for people. 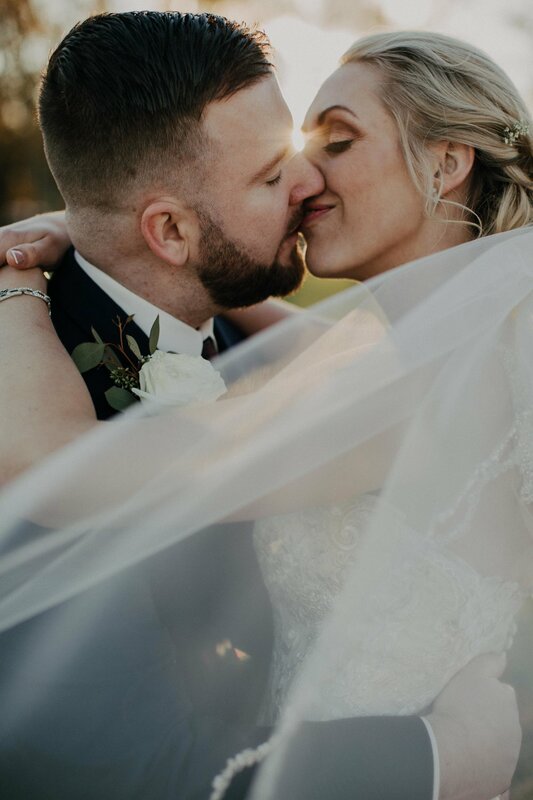 The way our special day was captured turned out simply perfect- candids and portraits alike! Just phenomenal. We can't reccommend hazel lining enough!! AMAZING! 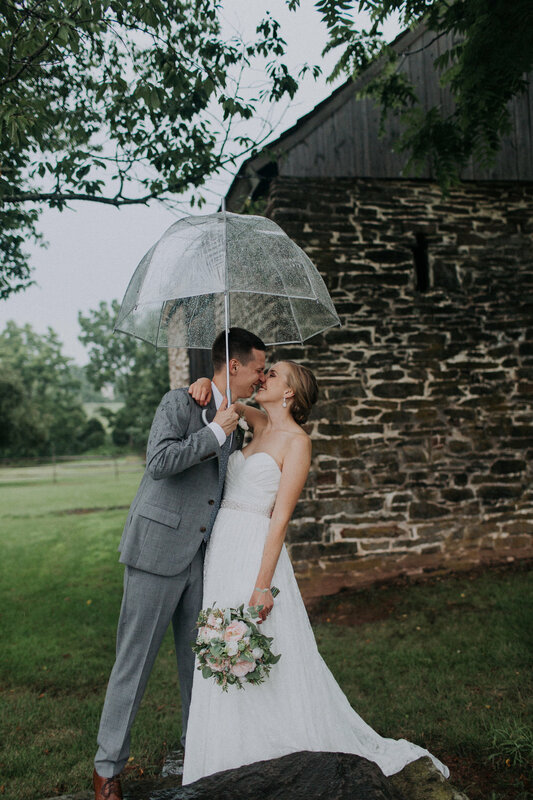 Let me just say, that Hazel Lining Photography was able to take my rainy wedding day, and turn it into the perfect memory with these beautiful photos! Working with Hazel Lining was not only the least stressful part of planning the wedding but also a HUGE help in finalizing details to the wedding that really made the day fall together. And not to mention that we got to see a snapshot of our photos after a few days and ALL of our photos were completed in less than a month! We were so thankful and excited to see how all the photos came together beautifully! Steph and her team were so helpful and did a fabulous job and I would recommend her to anyone who wants their photos to look like a FAIRY TALE! You truly cannot put a price on having a fabulous photographer and beautiful photos we'll be able to share with our future children! I gave Steph the link to my Pinterest board for inspiration and she went above and beyond my wildest dreams. 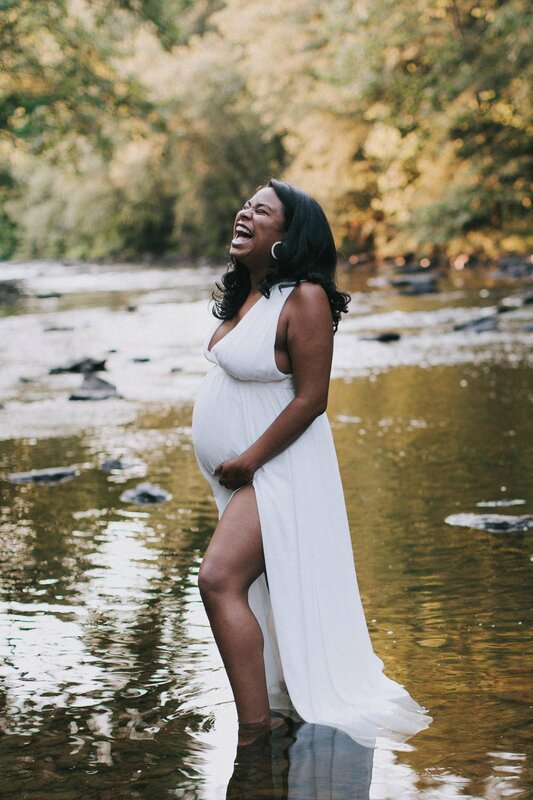 My maternity pictures came out looking so ethereal. She has such an eye and attention to detail. Steph is so easy to work with and knows how to bring the best out of you. I don’t think I’ve felt so beautiful. Thank you, thank you, a million times THANK YOU! "Where do I start? Working with Steph was a dream. From our initial contact, she was so helpful in assisting with our questions to ensure we were getting the package that was the right fit for us. We met her at our engagement pictures (which was a hot one!) and she instantly felt like an old friend of ours. We were so comfortable working with her and she without a doubt has an eye for detail. I loved her teasers on social media and we got our pictures back so timely! We knew the wedding pictures would turn out simply perfect. Through the course of the engagement, Steph was nothing less than helpful - answering any questions we had, setting up the day of timeline and providing details that would help us not a miss a beat the day of our wedding. It was also so fun hanging out with her! From the ceremony to the end of the night, they were on their A Game, which I truly believe they are never not. The ceremony and reception pictures are breathtaking. They are ALL breathtaking! It was so wonderful having them there with us, I will use Steph and her incredible services in the future. Thank you is not enough for the way you both captured the biggest day of our life, but thank you, thank you, thank you. I will recommend your services to anyone who asks - even if they don't ask!" "We booked Hazel lining to photograph both our engagement session and our wedding. We could not have been happier with everything that she did. Steph is awesome, so nice, professional, thorough and clearly just a wonderful person. She made us feel so comfortable during sessions even though we are both awkward and camera shy. She made sure we got all the pictures we wanted on our wedding day and did it in enough time so that we could make the entire cocktail hour which was important to us. The quality of her and her team’s pictures is amazing. We got our pictures back in a very timely manner and love them all! Would highly recommend Hazel Lining Photography to anyone!" "Oh my goodness, if I could give 10 stars to Hazel Lining, I would. Steph was amazing throughout our entire wedding planning process. She's so sweet and kind, and instantly made us both feel right at home. We had to reschedule our engagement photos several times due to weather/ conflicts/ etc., and she was so flexible and patient with us, and I could not have been happier with our in-home engagement session. At our wedding, she fit right into the party, snapping photos that didn't make us feel like we were being pulled away from time spent with our family and friends. 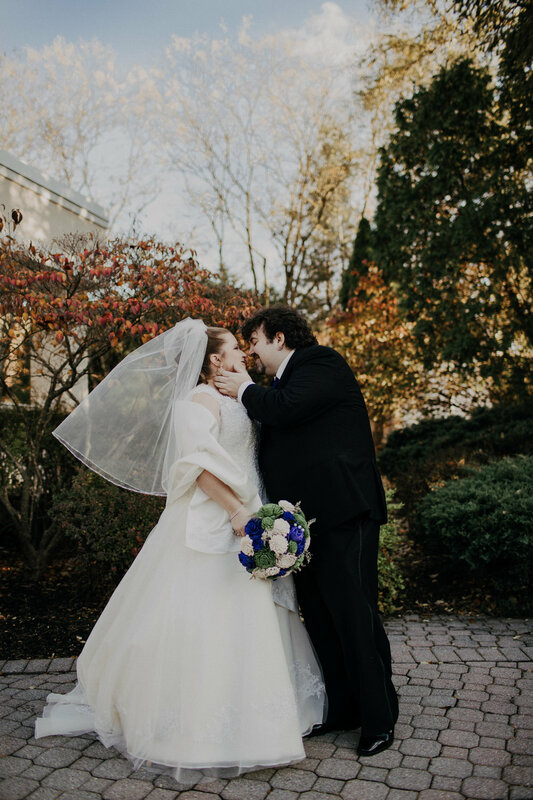 We just got the pictures back this morning (super fast turn-around time, by the way), and I can't stop smiling. Thank you, Steph! Thank you, thank you, thank you!" "My husband and I could not have been any happier with Stephanie! She was an absolute pleasure to work with through the entire wedding process, easy to get in contact with and was always quick to respond to any questions or concerns we had. She knew all the right questions to ask and all the details to include during the planning process. The day of the wedding it was obvious how experienced she was. She was able to organize our large wedding party and family to make sure we got all the pictures we wanted! I can’t tell you how many people came up to us to tell us how impressed they were with her! Stephanie had our pictures back to us extremely quickly... and they are STUNNING! I could not recommend her more!" "We booked Hazel Lining soon after being engaged. Having quality photos was one of the most important aspects of the wedding to me. Steph photographed both our engagement photos and wedding. 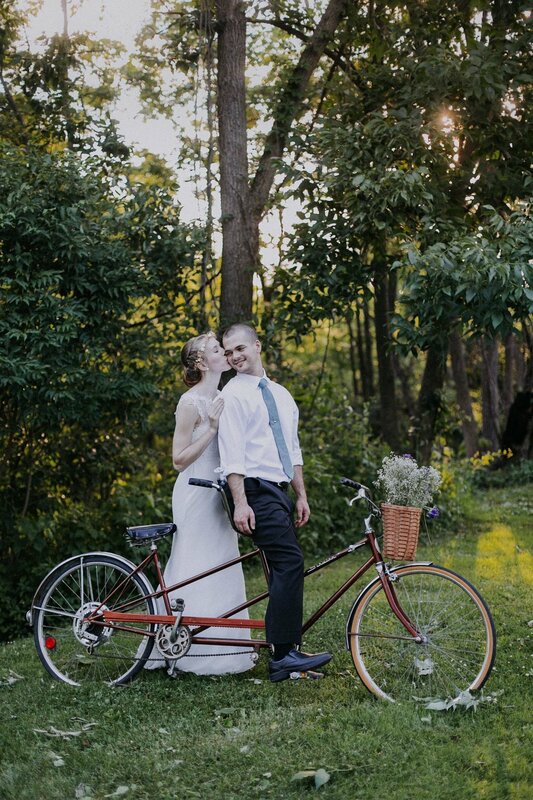 Her photos are beautiful--each one captures such a special piece of our perfect day. She works well in even the most challenging of conditions as she captured our portraits on a humid day with POURING rain! Hiring HLP was one of our best decisions for our wedding day, considering how terrible the weather ended up being. She is so easy to work with, making everyone feel comfortable and know what to do in front of the camera. Hazel Lining is fun, timely, organized, personable and creative!" "I cannot get enough of our wedding pictures. Every single time I look at them I cry all over again!! Steph and the Hazel Lining team are so incredibly professional and talented. They work so hard to come along side of their clients to be sure they deliver the highest quality and the best experience. They are completely effortless to work with and they constantly make you feel comfortable in front of the camera even if you usually aren't! I already am highly recommending Hazel Lining to anyone and everyone that I know!! I can't say enough Steph! You're amazing!" "I've officially worked with Steph on 3 occasions. My favorite happens to be my wedding, of course. Nevertheless, every time I see her photos I'm amazed at how talented her and her team are with how they capture beauty and light and joy in their photographs. She has a true gift for capturing treasured moments through the lens of her camera and providing them to her clients as wonderful memories! Not only that, but her and her team gave us plenty of laughs. It was super fun to work with all of them!" 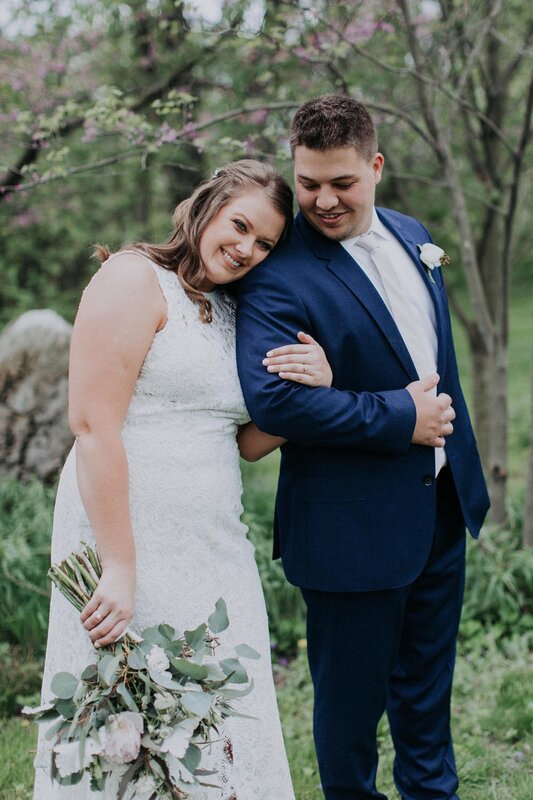 "Steph and her crew were absolutely amazing throughout our entire wedding process from the day we met her at a random bridal show we knew she had to shoot our wedding! She was always quick to respond to my millions of questions, and requests!!! Her eye for detail and catching even the littlest moments is absolutely amazing! She made us feel so at ease in front of the camera, our engagement photos and wedding photos were absolutely perfect! We would highly recommend her for ALL your photography needs!! If you're looking for a photographer you can stop looking now you have found her!" "We booked Hazel Lining on a whim after seeing just one group of pictures they had done for a wedding. Something about the pictures gave us the confidence that this was the photographer for us. And boy were we right!! Steph and her Hazel lining crew exceeded our expectations. After meeting Steph for the first time at our engagement session, we were so excited for what was to come for our wedding. Steph is extremely easy to work with and very personable. We felt so comfortable with her and her photographers. The compliments we continue to receive on our wedding photos are so positive. The compliment we receive most, is that the photographer seemed to capture each incredible moment so perfectly. Which is exactly how we feel. I have no idea how we will choose which pictures to frame. Thank you Hazel Lining, you are simply the best." "From the first meeting to post wedding day, Steph has been an absolute pleasure to work with throughout the entire experience. She made my husband and I feel very comfortable in front of the camera (which isn't the usual for us) and was very encouraging throughout our wedding shoot. Steph has a meticulous eye for showcasing all of the important details and truly creates beautiful works of art. Our wedding photographs far exceeded all of our expectations." "We had Hazel Lining photograph our recent wedding last month. From the first email to the wedding day, Hazel Lining has been easy and a joy to work with! We had engagement photos and our wedding photos done by them, and we received each session in less than two weeks and we couldn't be happier with the results!! Thank you Steph for capturing our special moments and being so fun to work with!!" "Steph did an awesome job capturing our wedding day on August 1, 2015! Hazel Lining is so easy going and relaxed throughout the day. It was such a nice surprise to get the sweet wooden flash drive in the mail with all of our pictures on them! Thank you, Steph, for everything!" "Hazel Lining did an amazing job for my wife and I throughout the whole process of our wedding. From the early planning stages, through to the beautiful wooden flash drive we received with our pictures, Steph was professional, flexible and fun. She was very open to shot ideas that we had, but also wasn't afraid to direct us to poses that looked great. Throughout the wedding, she and her second shooter were never intrusive but always got the right shots. We would recommend Hazel Lining to anyone and everyone!" "Just got done looking at our wedding photos posted on the Hazel Lining gallery. I absolutely love them and can't wait to get our thumb drive! They captured the entire day with such elegance and artistry, and even snapped some precious moments when we didn't know anyone was watching! I'm so happy that we went with such a talented photographer! Not to mention the reasonably priced packages to choose from! You get amazing pictures, without having to spend an arm and a leg." "Hazel Lining was the absolute best choice for our special day. After seeing Steph in action at my brother's wedding and looking through the online gallery, we didn't even think twice about who we wanted to photograph our wedding. Steph perfectly captured our day and was wonderful to work with. She is creative, fun, energetic, and takes the most beautiful pictures. We could not be more pleased. We love all of the pictures so much we can't decide which ones to frame!! Thank you, Hazel Lining!" "Hazel Lining was an incredible find. They perfectly captured the natural beauty of our outdoor ceremony. My (now) husband and I are both a bit uncomfortable in front of the camera, however they made us feel so at ease. The quality and professionalism of their work far exceeds any expectations we had." "We were married in October, 2014. Can we just say that Steph was so wonderful to work with! During the planning process we had so many questions and Steph was so helpful and prompt. We had a few ideas that we wanted to use for our photos and Steph just ran with them and made our pictures BEAUTIFUL! People are still commenting on how much they love all of our pictures. I would highly recommend Hazel Lining Photography, you will not regret it!" "It was a privilege to work with Hazel Lining for our engagement and wedding photos. We are blessed to have found a photographer with such wonderful work, and the attitude of such joy. Steph was absolutely wonderful to work with, and her pictures speak for themselves. She always had a smile on her face even amidst chaos and confusion, and I cannot thank her enough for her patience during our wedding day. Her eye for detail and creativity is evident in all her work. 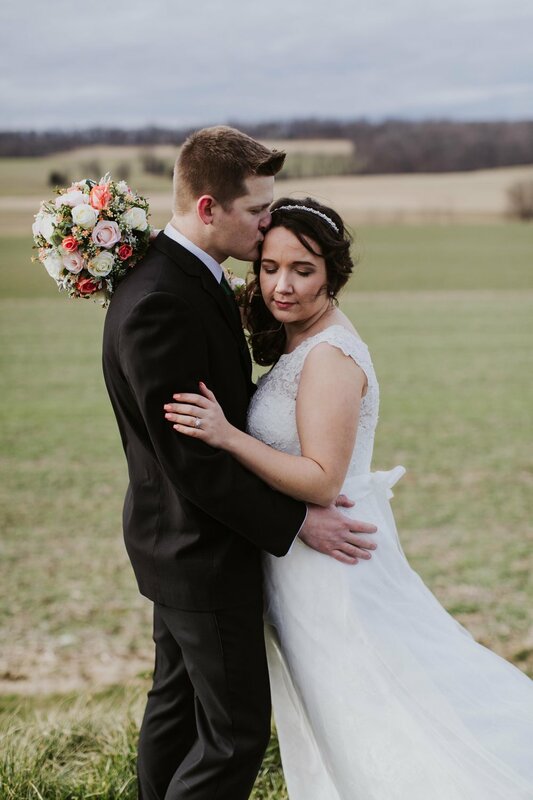 Being able to see a few pictures within hours of the wedding was such a gift, and having all the pictures within 2 weeks absolutely blew me away. I will cherish the pictures for ever. Thanks for everything Steph!" 2. friendly and non intrusive when she and her coworker come to your home or designated place to take photos. Such a joy to have around while experiencing your own wedding day. 3. takes charge & authority when you want certain pictures taken and the fact that she knows which ones should be taken. 4. the ability to be at the wedding, take a zillion pictures, and not even notice that she's there. 7. Hundreds of pictures in your mailbox within 2 weeks. "Hazel Lining was the absolute best choice we could have made for a wedding photographer! Steph did an amazing job for us and were SO much fun to work with! Her patience throughout the day kept us calm and made everything run smoothly. Also, her artistic and creative abilities are seen through our incredible photos-- they came out better than we ever thought possible! We are so thankful we had the opportunity to work with her! Thanks for everything!" We loved working with HLP for our engagement pictures and wedding day. The way Steph interacts with her clients makes you feel like you've known her for years. She is so friendly and patient. We love the way our pictures came out and were very pleased with the quick time frame. Our pictures were posted on the blog within a few days and shortly after we received the rest in the mail. “I have had the pleasure of experiencing Steph’s work and professionalism throughout a couple very important times in my life, for both my engagement pictures, my wedding & now our family. Steph has an incredible eye for detail and lighting that brings her work to life. She has a professionalism that she exudes in everything she does. I have worked with ”more established” photographers in the past and they don’t even hold a candle to her quality of work nor the overall experience. I would recommend Steph to anyone for any occasion and know that she will deliver an incredible product.